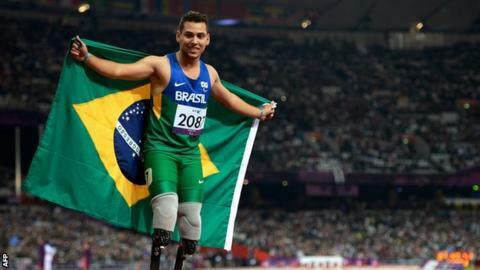 Brazil's Alan Oliveira has become one of the names of the 2012 Paralympics after beating South Africa's Oscar Pistorius in the T44 200m on Sunday night. Oliveira, 20, took the gold medal by just 0.07secs, leaving Pistorius - known as "Blade Runner" - to allege that his competitor had an unfair advantage by using blades that had made him a crucial two inches taller. The South African later apologised. Pistorius's shock defeat dominated headlines on Monday - but there was little mention of the man who had pipped him at the post. Alan's mother Claudia remembers the struggle to get him his first pair of prosthetic legs. "It was really difficult. At first we had to buy them ourselves and then we had to try and get the new ones from the public health system. But he always says to me: 'Mum, the past is the past. Let's focus on now'." She also said she didn't want him to run at first because he did not have proper running blades. "He was eight years old and he wanted to be a racer like his friends and neighbours, but I didn't want him to. It was 'mother's worry'." Her response to his unexpected win? "It was such an overwhelming emotion, I can't even explain." Oliveira was born in Maraba in Brazil in 1992, and had both his legs amputated at only 21 days, after an intestinal infection caused septicaemia. According to Brazil's Terra.com, he learned to walk by the age of two and was cycling by three. By the time he was eight, he had started competing in athletics. His desire to race was so great that he began running with wooden prostheses, totally unsuited to training, Brazil's Globo reported. He learned to open his legs wider than normal because the wooden limbs did not bend sufficiently to give him enough power, BBC Brasil said. He started competing in races in Brazil when he was 13. He only began running on carbon-fibre blades aged 15, shortly before attending his first Paralympics in Beijing in 2008, where he won a silver medal in the 4x100m relay. He also won bronze at the World Championships in Christchurch, New Zealand in 2011 and two medals the same year - a silver and a bronze - at the Parapan American Games in Guadalajara, Mexico. He had raced against Pistorius frequently before - the South African took the silver when the two competed in New Zealand last year - and said the two had been friends. But that friendship appeared to have been put under strain after Pistorius's post-race comments. "The situation is grim. He passes me and does not talk to me," Oliveira said on Sunday night. "I want to continue my friendship with him. I do not want controversy." Pistorius will have his chance to settle the score as the pair are expected to meet in the T44 100m final on Thursday, and the T44 400m final on Saturday.